LOS ANGELES, CA--(Marketwired - Oct 10, 2017) - The Harry Potter film series is one of the most successful cinematic franchises of all time and it continues to inspire a passionate and growing following around the world. One key that helped bring author J.K. Rowling's books to life on the big screen was the evocative music created for the films by great composers like John Williams, Patrick Doyle and Nicholas Hooper. Each soundtrack is contained in a gatefold sleeve that is die-cut on both sides. The images used for the picture discs are stills taken from the related films. The one exception is Harry Potter and the Order of the Phoenix, which also features an etching on the last side of the LP. The set also includes a download card so the music can be downloaded. 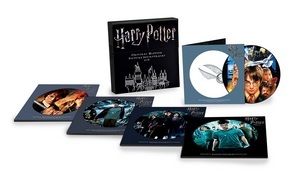 HARRY POTTER: ORIGINAL MOTION PICTURE SOUNDTRACKS I-V includes soundtracks for: Harry Potter and the Sorcerer's Stone (2001), Harry Potter and the Chamber of Secrets (2002), Harry Potter and the Prisoner of Azkaban (2004), Harry Potter and the Goblet of Fire (2005), and Harry Potter and the Order of the Phoenix (2007). The soundtracks to the first three films were all composed by John Williams, who is responsible for some of the most popular film scores in history. One song that debuted on the Philosopher's Stone soundtrack -- "Hedwig's Theme" -- became the main musical theme for the series and appears in all of the Harry Potter films. Patrick Doyle composed the music for Harry Potter and the Goblet of Fire (2005). The film's soundtrack also features three songs by a fictional rock band featured in the story whose members include Jarvis Cocker and Steve Mackey of Pulp, and Jonny Greenwood and Phil Selway of Radiohead. Composer Nicholas Hooper created the music for Harry Potter and the Order of the Phoenix (2007). It was performed by the London Chamber Orchestra and recorded at Abbey Road Studios in London.